If you follow my Instagram stories you probably noticed I eat a lot of gg crackers, especially for lunch. If you don’t know much about them, you may wonder why… I’ll tell you… one word… FIBER! After learning about the importance of fiber from Lauryn at The Skinny Confidential & the book The F-Factor Diet by Tanya Zuckerbrot, I decided I needed to add more fiber to my diet. Both Lauryn & Tanya are huge fans of the gg cracker, and it seemed like an easy way to incorporate more fiber into meals without having to do anything special. For me it works well because I am a major lover of carbs, and this fulfills that craving but in a super, super healthy way. Each gg cracker contains only 20 calories but 4g of fiber (14% of the recommended daily value!!) That means that having a few gg crackers at lunch can already guarantee that you’ll have almost half of your recommended daily fiber. Easy, right?! Plus it’s fun to make different types of meals with them – sandwiches, pizzas, the options are endless! Who else is tired of the endless amount of sickness and snow?! Now is the time of the year where I am so so ready for spring & it not being freezing outside. Definitely jealous of those of you who live in more mild climates – I do love the snow for the Christmas season, but as soon as January comes, I. Am. Over. It. Anyway, since it has been snowing everyday for the past week, chili sounded like the perfect meal. Warm, easy & filling… all the elements of a great winter dinner. I typically make a sweet potato quinoa chili recipe, but I wanted to change it up and try out a white bean chili this time. Sometimes chili can feel a bit mushy, so the roasted cauliflower adds a little crispy texture to the dish. As with most of my recipes, there is a spicy component (Frank’s Red Hot Sauce) but it can easily be omitted for those who don’t like spicy foods. Welp, I’d just like to start out by saying it’s not a great idea to finish a food/recipe post while you’re stuck in a waiting room with some fruit & nut packs for lunch. 😉 ANYway, who loves balsamic glaze?! ME! And everyone! ….right? It’s sooo good. I had kind of forgotten about it for awhile and something reminded me of how good it is and here we are. I found a similar reduced balsamic sauce recipe for a chicken wing recipe and decided to incorporate it into a vegan buddha bowl recipe. Buddha bowls are fun because they sound complicated & fancy but really it just means you tossed some random, delicious stuff together in a bowl. I originally made my bowls with brussels sprouts and zucchini for the veggies but a few nights later I had extra rice + sauce so I roasted some sweet potatoes and sautéed more tofu and it was equally as delicious. Use what you have! Anyone else always craving take-out, but not wanting to gamble on the places that actually deliver to your house being good? Well, that’s me. So I usually try to whip up something at home that’s easy AND healthier! The other great part of this dish is the minimal amount of prep. On my recent trip to Costco, I grabbed the pre-cut broccoli and baby carrots and WHOA, it makes cooking so much easier. No more peeling carrots or broccoli mess all over the counter! Usually the worst part about being a vegetarian is missing out on all of the fun, nostalgic-type meals that have meat in them. I’m always trying to come up with ways to make similar dishes with meat substitutes. These walking taco bowls are SO GOOD, even meat eaters will be impressed! 1. Combine all taco meat ingredients in a food processor. Pulse several times until crumbly, but make sure not to over-blend… It will get pasty. 2. Place all ingredients in a bowl. Add toppings like sour cream, ranch, hot sauce or whatever you prefer. You can decide whether you want to put them in dorito bags or actual bowls – we have done both, and I usually prefer a real bowl. We also like to use different variations of toppings, depending on what we have on hand. I don’t know what took me so long to make a faux chicken meal with cauliflower. I’ve done about everything else with it – steamed, roasted, pizza crust, etc. This recipe is SO easy – I whipped it up while the kids were playing and Jerad was working late. I used this recipe, but I doubled the amount of sauce (as shown below) because I used a large bag of cauliflower from Costco. I would totally recommend doing this… I only had to cut a few of the pieces smaller – less prep work, and more to eat! 1. Preheat oven to 400F. Set aside whisked egg in a small mixing bowl. Set aside bread crumbs in a flat container. (this worked perfectly) Dip cauliflower pieces in egg and then roll in bread crumbs until fully coated and place on a baking sheet lined with a silicone mat. You may need to use your fingers to help press on the coating to help it to stick to the cauliflower bites. Repeat until all cauliflower is coated. 2. Bake for about 15-20 minutes or until coating is a light golden brown and crunchy. 3. While the cauliflower is baking, make the sauce. Using a small saucepan, add all ingredients listed except the last set (2 tbsp water + 1 tbsp cornstarch). Bring sauce to a low boil, stirring constantly. In a small bowl, completely dissolve cornstarch in water, then add to the mixture. Stir until sauce boils again and cook until sauce thickens. Drizzle sauce over cauliflower. Add fresh chopped scallions if desired. I think I could eat some type of Asian cuisine every day of the week. I seem to be over-doing it on the stir fry type dishes lately, so I decided to try something different. Enter Spicy Thai Quinoa bowls… I had been off the quinoa train for a while, but lately it’s all I want. It’s the perfect way to get that stuffed tummy carb feeling, but without loading up on real carbs. Also a great way for a vegetarian to get protein! Process all ingredients in a food processor until smooth, scraping down the sides of the bowl as needed, about 1 minute. If you don’t have a food processor or don’t want to use it, I’ve also just swapped the peanuts for about 1/4 cup of peanut butter and whisked all the ingredients together for similar results. Rinse the quinoa in a strainer under cold water until the water runs clear. (Even if your quinoa says its pre-rinsed, still rinse it! It will make it super fluffy and is so worth the extra step! Place in a large saucepan; add the coconut milk, vegetable broth, and measured salt; and stir to combine. Bring to a boil over medium-high heat. Reduce the heat to low and simmer, stirring occasionally, until the white outer casings on the quinoa have popped, revealing translucent little beads, about 15 to 20 minutes. Trim the carrots and cut them into 1/4 inch-thick rounds; set aside. Cut the broccoli into 1-inch florets; set aside. Thinly slice the white and light green parts of the scallions; set aside. When the quinoa is ready, put in a large serving bowl and set aside. Wash the saucepan, fill it with water, and season generously with salt. Cover with a tightfitting lid and bring to a boil over high heat. Meanwhile, heat the avocado oil in a large nonstick frying pan over medium-high heat. Add the tofu and cook without stirring until the bottoms are golden brown, about 5-6 minutes on each side. Remove from the heat and set aside. Add the carrots to the boiling water and cook until crisp-tender, about 2 minutes. Using a slotted spoon, remove them to the bowl with the quinoa. Return the water to a boil, add the broccoli, and cook until crisp-tender, about 3 minutes. Drain and place in the bowl with the quinoa and carrots. Add the cooked tofu, dressing, and scallions to the bowl and stir to combine. Sunday night/Valentine’s Day dinner… We’ve had an abundance of veggies since I ordered groceries late last week. I decided to throw them together for a simple asian stir fry. This is another meal where you could use whatever veggies you have on hand – green beans or mushrooms would also be a great addition to this. Begin boiling water for brown rice and make per package instructions. The brown rice I buy takes about 35 minutes to cook. In a small bowl, whisk all of the sauce ingredients together. When the tofu and rice have about 15 minutes left to go, start heating up sesame oil in a large skillet. Once oil is hot, add veggies and toss to coat. Cook until slightly tender, and then add stir fry sauce. Cook a little longer until the veggies are coated with sauce. Serve veggies over rice with the tofu. Sometimes you just need some pasta. 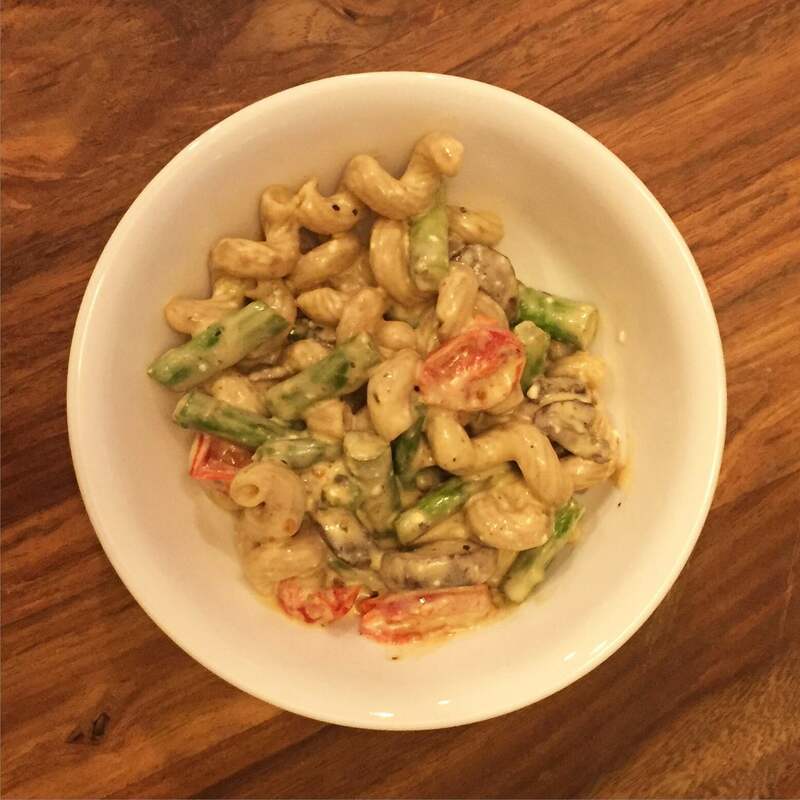 Nothing is more relaxing than sitting down after a long week of work (or a long week with two crazy little ones, in my case) and eating bowls of delicious, creamy pasta with veggies. My mom started making a version of this pasta back when Jerad and I first starting dating and it has become one of our favorites over the years. It’s great because you can keep it simple with cherry tomatoes and spinach or you can add lots of veggies, like I did with mine – mushrooms, asparagus and cherry tomatoes this time. It also tastes great with more spice – whether you want to add more cajun seasoning or hot sauce. This version is pretty light so that it’s kid-friendly… Finn gobbled up three servings of this tonight! Melt butter in a separate pan. Add mushrooms and asparagus. Sauté until tender, adding salt and pepper for seasoning. Add cherry tomatoes until they get slightly tender. Put veggies in a separate bowl and put the cream cheese and about 1 cup of veggie broth into the pan. Continue stirring the cream cheese until it is fully incorporated into the broth. Add the italian and cajun seasoning, as well as some pepper. Add more broth and simmer for a few minutes until the sauce begins to be semi-thick and creamy. Once you have drained the pasta, add the pasta and veggies into the sauce and stir until combined. Serve immediately. If you have leftovers, I suggest adding more broth to the pasta so that the sauce doesn’t thicken up too much when you go to re-heat. Hello again. Yes, I’m baaaaack! I’m trying to keep up at this and not doing very well. Lately my favorite way to make dinner has been to google a few ingredients that I have/sound like they’d be good together and see what I come up with. I had a pre-made flatbread to use so tonight I started off by searching “vegan pizza recipes” — I stumbled upon this: onegreenplanet.org/plant-based-recipes/caramelized-vegan-onion-tart-with-olives/ — While the pizza sounded good, I wasn’t quite feeling the vegan option so I searched “caramelized onions and gouda” and found this: epicurious.com/recipes/food/views/Smoked-Gouda-and-Caramelized-Onion-Quesadillas-699. 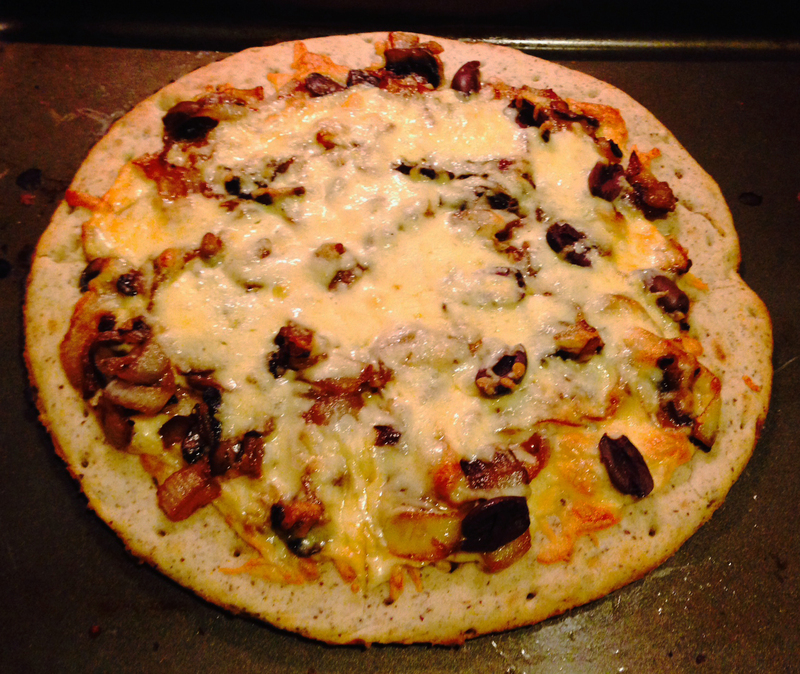 I decided to combine the recipes and made my creation: Caramelized onion and mushroom pizza with balsamic glaze. I’m not a big olive eater but J loves them, so I added them on half the pizza. 1. Preheat the oven to 450 F. Start julienning the onions. They don’t have to be perfect, but try to at least get them all about the same thickness. 2. Heat the olive oil in a pan on medium heat. Add the onions and sauté for about 5 minutes, stirring occasionally. 3. While onions are sautéing, wash and cut up the mushrooms into slices. Add approximately 1 tsp of salt to the onions. 4. Keep sautéing the onions. After about 10 minutes, add 1 tsp of sugar. You may want to add more to get them extra caramelized. 5. At this point, push all the onions to one side of your pan and add the mushrooms and a TINY bit of olive oil. Sauté the mushrooms until soft and then stir into the onion mixture. 6. Once your oven is preheated, you may want to put your pizza crust in for a few minutes so it cooks completely once toppings are added. With my crust, I put it in for about 4 minutes. 7. Pour the balsamic vinegar into a separate pan and heat to medium heat. Let simmer for about 10 minutes. Keep stirring to prevent it from burning. Balsamic will begin to reduce and turn into a glaze. Take off the heat once it thickens up. 8. Take your crust out of the oven (if you pre-cooked it) and start by putting a layer of gouda. Use about half of your cheese. Place the onion & mushroom mixture evenly on the pizza. Add the Kalamata olives. Add the last half of the gouda mixture. 9. Cook pizza per crust’s instructions or until the top is melted. Let cool & cut. Serve with reduced balsamic glaze on top.